I have opted for the Vetterman crossover exhaust from Van's. Oh sure, it was not cheap. But the quality is amazing and it fit like a glove first time on. Can't say that about too many things on this plane. You can't see it too well here but the exhaust is hung on a shock mount type feature. Easy and quick to install. Here are some close-ups of the shock mount for the lower stacks. 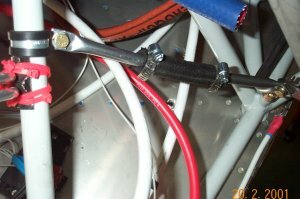 These are basically clamps around the exhaust and the engine mount, connected by rods connected by fuel line.